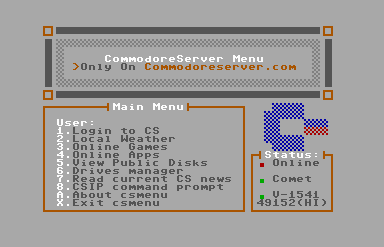 The CSApps disk contains all of the official CommodoreServer applications and games once found on the V-1541 disk. As the number of apps and games increased, a new disk was needed to hold these. Any app/game can be loaded from here using V-1541 and a Comet64 or compatible Internet modem. New! csMenu v1.2 - now compatible with all other user port modems. NEW! Horse Racing - place bets with CS Tokens.